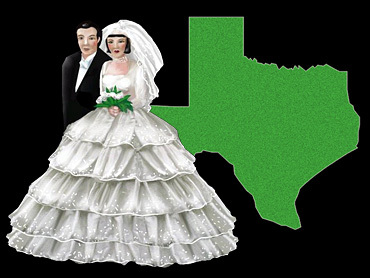 Oops: Did Texas Ban Marriage? Texas lawmakers wanted to make sure gay people couldn't be married. Instead, it seems, they may have made sure no one can. The Fort Worth Star-Telegram has the story. Here's what happened: In 2005, Texas voters and the state Legislature approved a Constitutional amendment to ban gay marriage. But the amendment included the following clause, which was reportedly designed to ban civil unions and domestic partnerships: "This state or a political subdivision of this state may not create or recognize any legal status identical or similar to marriage." One thing that is "identical…to marriage," of course, is marriage. And Texas Attorney General candidate Barbara Ann Radnofsky, a Democrat, is arguing that the current Attorney General, Republican Greg Abbott, made a "massive mistake" in allowing the language. "You do not have to have a fancy law degree to read this and understand what it plainly says," she said, according to the Star-Telegram. She called on Abbott to acknowledge the error and consider apologizing. Abbott says the clause isn't a problem. His spokesman declined to directly address Radnofsky's charges but said the statute is Constitutional. A representative of the group that helped draft the amendment, meanwhile, said a lawsuit based on the wording had little chance of being successful. But Radnofsky suggested the language clearly bans all marriage. "Whoever vetted the language in [the clause] must have been asleep at the wheel," she said.